Some of the students were very nervous about trying a new sport for the first time. It was a beautiful thing to watch these special students face a fear and get on the court for the first time in their lives. Board members, parents and other fans gathered at the Cumberland Academy of Georgia gymnasium on Friday, December 8, to watch a basketball game between the students and faculty members at the Atlanta special-needs school. Senior living community, Dogwood Forest of Dunwoody, a new partner with Cumberland Academy, helped sponsor the event. Dogwood Forest provided special t-shirts for Cumberland Academy faculty and students, and some of their staff came by before the game to deliver snacks to the students. Dogwood Forest also reached out to Chick-fil-A, requesting them to deliver food for the students and staff. Additionally, Dogwood Forest and Cumberland discussed additional ways for residents and students to support each other through student volunteer days. Scarborough said she very much appreciated Dogwood Forest’s support. 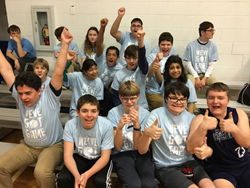 “Not only did they help out a lot with the basketball game, our teachers are working with them on developing a plan for our career prep students to volunteer weekly at Dogwood,” she added. Other highlights of the student-faculty basketball game included: WSB-TV sportscaster, Van Earl Wright, who was the play-by-play announcer of the game. Cumberland Academy’s newly-developed spirit club sold shakers to attendees. Cumberland seniors were honored as the first students on the court. Former NBA basketball player, Eddie Lee Wilkens, had planned on playing on the students’ side, but wasn’t able to make it due to the snowy weather conditions. Mr. Wilkens is an annual guest and students enjoy playing with him each year.